Like humans, canines have unique nutritional needs. As a pup parent, it’s imperative that you are feeding your furry family member a high quality dog food that will meet his unique nutritional needs. A well balanced diet that features protein and a range of vitamins, minerals, and other essential nutrients is vital for a dog’s overall health and well being. But there are so many different dog food brands on the market that it can be hard to decide which option to feed your pup. Furthermore, not all dog foods are created equal; many are packed with artificial colors and flavors, preservatives, and fillers that can actually do more harm for your pup than good. There are, however, several brands of dog foods that feature premium ingredients that will meet the dietary requirements of your pooch, and one of those brands is Wellness. Known for their use of real animal proteins and whole grains – among other things – feeding your dog Wellness will certainly keep your pup in prime shape. But this reputable brand offers a variety of formulas, so deciding which option to offer your pooch can be a bit tough. Now that you’ve had a look at our top five Wellness dog food picks, let’s take a closer look at each option. Below, we offer a more detailed look at each formula. We discuss the ingredients, what we like about them, and what customers had to say. After you have read through the reviews and selected what you think is the best choice for your dog, click on the buttons to find the best prices currently available on Chewy and Amazon. 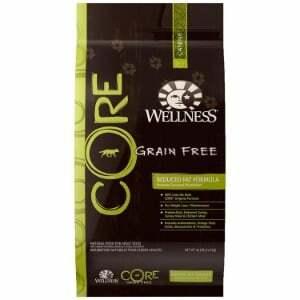 If your dog has a sensitivity to grains or you would just like to feed him a grain free dog food, Wellness Core Natural Grain Free Dog Food Original formula is a great option to consider. This food is 100 percent grain free, so you’ll have peace of mind knowing that it won’t cause any adverse effects. It’s also completely balanced to ensure that your furry friend is eating a well balanced diet. The first ingredient in this Wellness dog food is real protein from the best quality turkey and chicken. Both meats are deboned, and the remaining parts are ground into turkey and chicken meal to ensure that your pup is receiving the proper amount of protein. Real vegetables are also mixed into the recipe, including tomato, spinach, kale, sweet potatoes, and carrots. It also features real fruits, such as blueberries and apple to ensure that your canine companion is receiving the ultimate nutrition. The addition of four strains of probiotics and a range of vitamins and minerals, including vitamin B12, vitamin E, zinc, and glucosamine, round out the ingredients and provide your pooch with the most balanced meal. Since it’s grain free, there is absolutely no corn, wheat, or soy added. This food is also free of meat byproducts, artificial colors and flavors, as well as preservatives. Final Verdict: For a well balanced, grain free, high protein food for your pooch, Wellness Core Natural Grain Free Dry Dog Food Original is a great choice. Our panel of experts and the majority of customers who have used this product agree that this is one of the highest quality dry dog food formulas on the market. Whether you have a German Shepherd, a Mastiff, a Doberman, or any other breed, ensuring that your pup maintains a healthy weight is essential to his overall health and wellness. Wellness Complete Health Natural Dry Dog Food is specially formulated to keep your dog’s weight in-check while offering him the vital nutrition that he needs. This low calorie formula is a great dog food for weight loss, as it will ensure that your pooch remains trim while offering him all of the vitamins, minerals, and other essential nutrients that he needs. Featuring deboned chicken as the first ingredient, Wellness Complete Health Natural Dry Dog Food serves up the right amount of protein to strengthen and maintain your furry friend’s joint and bone health. Other ingredients include oatmeal, barley, brown rice, tomato, rye, rice bran, carrots, spinach, sweet potatoes, apples, blueberries, flaxseed, and a bevy of vitamins and minerals to support your pup’s overall health. Glucosamine, manganese, iron, and green tea extract are just some of the other types of goodness that this Wellness formula offers. It’s completely free of wheat, corny, soy, meat byproducts, artificial colors and flavors, as well as preservatives, so you can rest assured that your four-legged family member will receive the very best nutrition. Final Verdict: Whether your dog needs to lose a few pounds or you just want to ensure that he maintains a health weight, Wellness Complete Health Natural Dry Dog Food is worth considering. The reduced calorie content and high nutrition profile will keep your pooch in great health. Most users said that their dogs’ loved the taste. 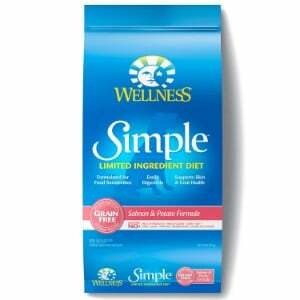 For pet owners who are looking for a dog food for sensitive stomachs, or who have dogs that are sensitive to certain ingredients used in many dog nutrition products, Wellness Simple Natural Limited Ingredient Dry Dog Food is an option worth considering. This dog food is specifically made for dogs’ that have allergies or delicate tummies, as it is made with limited ingredients. The Limited Ingredient formula from Wellness features a single source of protein as the first ingredient; premium quality salmon. It also features carbohydrates that are easy to digest and provide a balanced meal. Some of the other ingredients featured in this blend include tomato pomace, ground rice, and flaxseed. It’s also fortified with a wealth of vitamins and minerals, including vitamin A, vitamin B12, vitamin D3, riboflavin, copper sulfate, zinc sulfate, manganese, calcium, vitamin E, and tourine. Natural fish flavor further enhances the flavor to please your pup’s palate. As with all products offered by Wellness, there aren’t any artificial colors or flavors, gluten, or wheat. It’s also completely free of artificial additives. Final Verdict: For dogs that have delicate tummies or food allergies, Wellness Simple Natural Limited Ingredient Dry Dog Food will provide him with all of the nutrients he needs and none of the gluten and fillers that he doesn’t. Most users say that their pups have had great results with this dog food for allergies and report that their dogs love the flavor. For pet owners that are looking for a grain free alternative to dry dog food might want to consider feeding their pets a high quality grain free wet dog food instead. 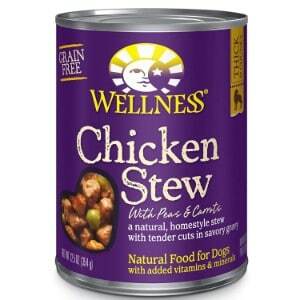 This formula is a slow-cooked stew that features premium quality chicken as the first ingredient. It also contains chicken liver for added protein and a wide variety of vegetables, including potatoes, peas, carrots, eggs, red peppers, and celery. The ingredients are mixed together with chicken broth, rosemary, thyme, and sage and slowly stewed to create a plentiful, well balanced, and completely tasty meal that your furry friend will be sure to love. In addition to the natural ingredients that are featured in this Wellness wet food formula, it also contains several nutritional supplements that are vital for your dog’s health, such as potassium, vitamin E, vitamin A, thiamine, vitamin B12, vitamin D3, zinc, and copper. Of course, like all other Wellness products, this wet food formula is completely devoid of meat byproducts, artificial colors and flavors, and preservatives. It’s also free of wheat. Final Verdict: Wellness Thick and Chunky Natural Wet Grain Free Canned Dog Food is a premium quality grain free wet dog food. Made with all natural ingredients and packed with tons of vitamins and minerals, and offering a flavor that your dog will be sure to love, pet owners and our panel of experts agree that this is one of the best wet dog foods on the market. 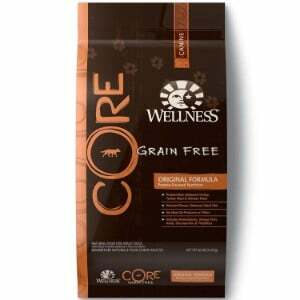 Last, but definitely not least on our list of the best dog food options from Wellness is their Core Natural Grain Free Dry Dog Food Reduced Fat formula. This 100 percent grain free dog food contains absolutely no wheat, corn, or soy, so if your dog has allergies or a sensitive stomach, you’ll have peace of mind knowing that this recipe won’t aggravate his system. In addition to being grain free, this Wellness formula is reduced fat to help your pup maintain a healthy weight. Weight control is important for dogs of all ages and sizes, but particularly dogs that are prone to joint issues like hip and elbow dysplasia, such as Dachshunds, Great Danes, Chow Chows, and Miniature American Shepherds. When dogs carry excessive weight, it puts more strain on their joints, which can compound problems with their musculoskeletal system. Excess weight can also cause a range of other health problems. In other words, feeding your pup a reduced fat formula, like this option from Wellness, will help to improve his overall health and well being. As always, protein sourced from real meat is the first ingredient; in this reduced fat formula, protein sources include chicken, turkey, and salmon. It also contains a bevy of fruits and vegetables, as well as added vitamins and minerals for optimal nutrition. Final Verdict: By offering your dog Wellness Core Natural Grain Free Dog Food Reduced Fat formula, you’ll be able to help him maintain a healthy weight. You’ll also offer him a wealth of vitamins and minerals that are essential for his health. While some users did say that their dogs didn’t like the flavor, the sense of taste varies from dog to dog, so just like any other dog food, it may not be pleasing to all pups’ palates. As a pup parent, making sure that your dog receives the very best of care is your top priority. After all, he’s more than just a pet; he’s a member of your family! To that end, you have probably put a lot of research into selecting the best quality products for your furry family member. He has the most secure dog crate, the comfiest dog bed, a well-equipped dog house to keep him safe outside, an outdoor dog kennel that offers plenty of space, and perhaps even a dog playpen where he can play and explore in safety when you can’t give him your undivided attention. Of course, he also has the most comfortable dog collar and dog harness to keep him protected while he’s exploring outside. But of all the products that you choose for your pup, there’s one that is more important than all of the rest: his food. In order to ensure that your four-legged family member lives a long and healthy life, feeding him a well balanced diet that meets all of his nutritional needs is of utmost importance. That’s why it’s essential to choose a high quality dog food that features premium quality ingredients. With so many dog food choices on the market, it can be hard to choose the best option for your pup’s needs. 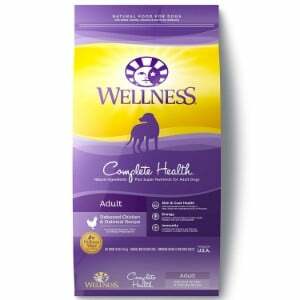 Wellness is one of the most highly regarded dog food manufacturers. If you’re interested in learning more about this company and their food choices to determine if it’s the right choice for your pup, keep on reading. Wellness is an American based company that’s dedicated to making the best possible food choices for canines of all ages, sizes, and dietary needs. The well being of animals is the very foundation of the company, and they believe that nutrition lies at the heart of a dog’s well being. The company was founded in 1997 by a group of veterinarians, animal nutritionists, and scientists that specialize in pet food. Today, they are recognized as one of the most reputable manufacturers of dog food. That’s because their products feature only the highest quality ingredients and are completely free of additives, artificial colors and flavors, and preservatives. The Wellness brand of dog food is so highly regarded because they feature the very best possible ingredients in all of the formulas that they make. Their ingredients are in complete compliance with the dietary recommendations that are made by Associate of American Feed Control Officials (AAFCO). Additionally, they base their ingredients on the diets that domesticated dogs ancestors consumed when they were in the wild. With that said, all of their formulas feature premium quality proteins, as well as natural vegetables and fruits. They are completely devoid of fillers and other additives that can be found in foods that are made by many other dog food manufacturers. In other words, your pup will be receiving the best possible foods to meet his nutritional needs with any of the additives that have been found to cause adverse reactions in canines. Natural proteins that are derived from real animal meat, such as turkey, chicken, and fish. The protein content in most Wellness formulas is approximately 35 percent. Healthy fats, such as monounsaturated fats, polyunsaturated fats, and essential fatty acids, including Omega 3 and Omega 6. So, why should you consider filling your furry best friend’s dog bowl with Wellness brand dog food over other brands that are available? In short, because the food options offered by this company feature only the best possible ingredients to ensure maximum nutrition; you can rest assured that all of the unique nutritional requirements of your canine companion will be met when you feed him Wellness. This company also offers a variety of recipes that are specially formulated to meet the unique dietary requirements that many dogs have. For example, if you’re looking for a food for large dogs that can help manage healthy weight, then their low calorie formula is a great option. Or if you’re looking for a high protein dog food, then you’ll find that virtually any of the Wellness recipes will meet your needs. There’s a dizzying amount of dog food products on the market, which can make it difficult to narrow down your choices and select something that you can truly count on to offer the best possible nutrition. With Wellness dog food, you can rest assured that your dog will be consuming a well balanced diet that will meet all of his needs and help him live a long, happy, and healthy life. The five Wellness formulas featured in our review are, what we believe, to be the best options available; however, every product from Wellness will offer complete nutrition for your dog.